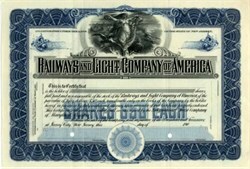 Beautifully engraved RARE SPECIMEN certificate from the Railways and Light Company of America printed in 1901. 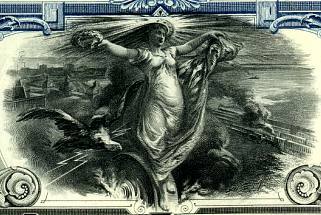 This historic document was printed by the Western Banknote Company Chicago and has an ornate border around it with a vignette of an allegorical woman flying on a wheel next to an eagle with a train below. This is the first time we have seen this item for sale, possibly unique.